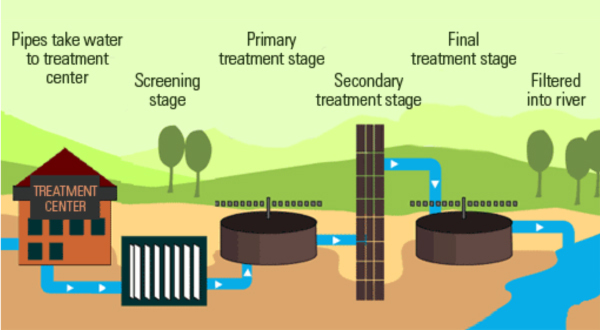 Screening is first stage of the wastewater treatment process. Screening removes large objects like, diapers, nappies, sanitary items, cotton buds, face wipes and even broken bottles, bottle tops, plastics and rags that may block or damage equipment. This involve the separation of organic solid matter (or human waste) from the wastewater. This is done by putting the wastewater into large settlement tanks for the solids to sink to the bottom of the tank. The settled solids are called ‘sludge’. At the bottom of these circular tanks, large scrappers continuously scrape the floor of the tank and push the sludge towards the center where it is pumped away for further treatment. The rest of the water is then moved to the Secondary treatment. The water, at this stage is put into large rectangular tanks. These are called aeration lanes. Air is pumped into the water to encourage bacteria to breakdown the tiny bits of sludge that escaped the sludge scrapping process. Next the ‘almost’ treated wastewater is passed through a settlement tank. Here, more sludge is formed at the bottom of the tank from the settling of the bacterial action. Again, the sludge is scrapped and collected for treatment. The water at this stage is almost free from harmless substances and chemicals. The water is allowed to flow over a wall where it is filtered through a bed of sand to remove any additional particles.